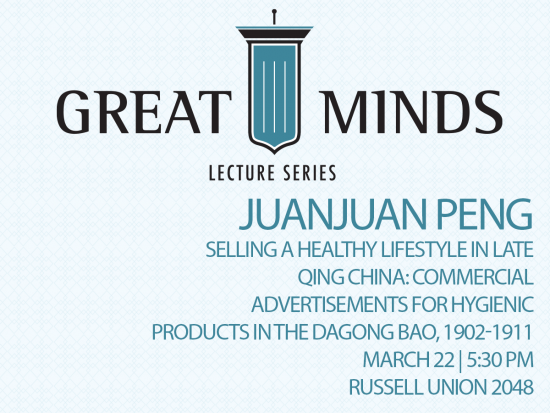 Juanjuan Peng, Ph.D., continues the Great Minds Lecture Series Tuesday, March 22, at 5:30 p.m. in the Fielding S. Russell Union, room 2048. The lecture will explore newspaper advertisements in early 20th century China and introduces the modern Chinese concept of “weisheng,” a Chinese term that is normally translated as hygiene. She will showcase the differences between the Chinese “weisheng” and the western hygiene and explain what these products were, who was using them, and what role gender played in their consumption. Peng has taught in the Department of History since 2007 and is currently a tenured associate professor. Her teaching and research interest includes social and economic history, history of modern China, and business history. Peng received her Ph.D. and M.A. from Johns Hopkins University and received a B.S. and M.S. from Wuhan University in China.